Lt. Commander Laura M. Cobb was born on May 11, 1892, in Atchison, Kansas. She was raised in Mulvane, Kansas, graduating from Mulvane High School in 1910. She entered the nurses training program at Wesley Hospital in Wichita, Kansas, graduating in 1918. Lt. Commanders first enlistment in the U.S. Navy took place July 5, 1918, where she worked in stateside hospitals until July 21, 1921, when she left the Navy and worked as a civilian nurse until April 1924, when she rejoined the Navy. 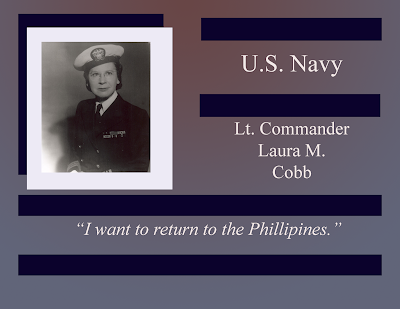 Lt Commander Cobb was stationed in Guam during the typhoon of November 1940 that damaged nearly every structure on the island and it is noted in her military file how hard she worked during the disaster. Transferred to the Philipines on February 1941 as the chief nurse of the Canacao Naval Hospital in Manila. When the Cavite Naval Yards was attacked, she and 10 other nurses remained behind with the wounded. 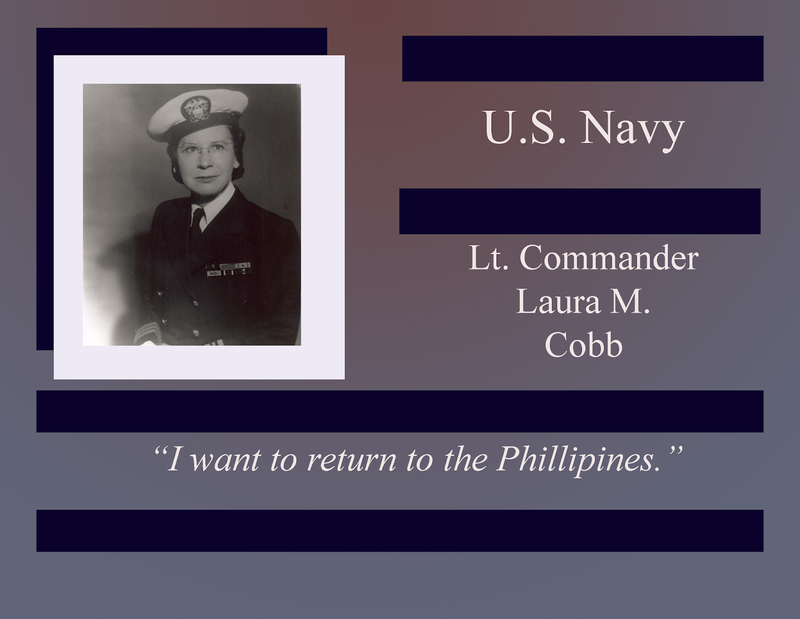 After the surrender on January 2, 1942, she and the other nurses were sent to the Santo Tomas camp, where they were joined by U.S. Army nurses after the Battle of Corregidor. In May 1943, Lt Commander Cobb and the Naval nurses established Los Banos, where they worked twelve-hour shifts and saw over 200 patients each day. Known here as the sacred 11, they, like all other prisoners survived on a meager diet of 900 calories or less a day. They were liberated during the raid at Los Banos on February 23, 1945. Lt Commander Cobb retired from the U.S. Navy in 1947, working as a nurse in Los Angeles until 1974 when she retired to Wichita, Kansas, dying in September. 1981.